Each component is discussed in terms of its purpose, premise, processes, practices, and payoffs. Revealing examples based on the authors' experiences in classrooms across the country show what evaluation, supervision, and reflection look like when they’re not done well—and what they could look like if done more effectively. Learn six ways to work with teachers more effectively in this infographic. "Too often it is assumed that observation leads to improvements in student learning. Valid and reliable evaluation can 'measure' what teachers do, but the emphasis too often is on accountability—not improvement. Building on trust, Frontier and Mielke address this imbalance. By providing the processes and protocols that empower educators to effectively reflect on their professional practice, teachers can actually improve their teaching. Here's how to optimize the impact on student learning." "Teacher evaluation will soon be in a state of flux given that the grand scheme to use teacher evaluation to 'weed out' ineffective teachers and 'reward' effective teachers has simply not worked because the movement was solely focused on measuring teachers as opposed to helping them grow. 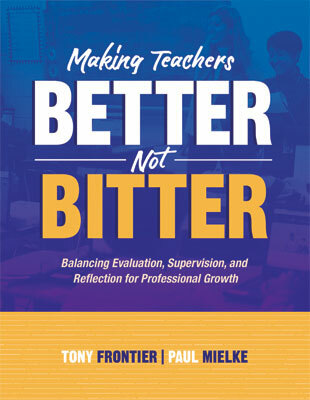 Frontier and Mielke have provided a template for the new era of teacher evaluation. It is based on sound research and theory, sound insights, and, most importantly, the right vision for the future."